“If you go to Kindia, you know: go up Gangan and go and see my Guinean family”, said Monique, my Belgian friend in Liberia. Despite the fact that Monique had left Guinea with a bad taste in her mouth, she thought a lot about her “family”. So, Samory made a phone call and nodded his head, “my friend Moussa will take you”. In a few minutes a guy with a smile like a half moon arrived and opened the doors of the grey Renault. Leaving Conakry behind was no easy task; the city was blocked up with bottleneck traffic that choked its way through the capital in long, irregular lines. The commotion persisted beyond the city limits and we found ourselves in an infinite line of cars several times, unable to move an inch. It was a little. Agonising. The colours gleamed, and the dust snuck its way into the Renault, victim of the sprays from the tyre rims of the cars that cut in from the dirt track on the right, an option which Moussa ended up taking himself, and only then could we make headway. During the journey we were sheltered by a greenish landscape, with rolling hills and a certain golden tone of wheat, which alluded to the Savannah and the region of Sahel, much further north. The landscape was an ordered entity, in harmony with the adjacent vegetation, with the other trees: there was room for everything. It was sunny, and there was a breeze, perhaps a pleasant one, we reached Kindia and its African features: mud and zinc huts, dirt paths. From above, the green and the mountains observed us. In the cool and welcoming Hotel Mabasi, Moussa and I ate our fair share of really juicy lamb chops. There is a lot of meat in Guinea. You can spot numerous livestock in transit, grazing in pathways, lots of sheep (soon the Muslim festival of the sheep was taking place), plenty of cows, goats. Moussa wiped his mouth and told me he would be back in a few minutes. On returning, he appeared with a downcast look upon his face which made sense when he revealed to me that it had been impossible to find a guide to go up Gangan, the most important mountain in Kindia. “Go and see my Guinean family”, Monique had said to me. After numerous sighs interspersed with smiles, Moussa concluded with a “whatever, I will be your guide. Let’s go”. Over dirt paths we went, opening the way with the Renault through Kindia, Moussa took some walnuts and stopped right at the foot of the path that ended with the high and boastful Gangan which looked at us distantly and defiantly. Pride. Urged on by the overdose of urbanism and cars in Conakry, the peace and calm brought about by this landscape so green, so tranquil, so clear, smelling of savannah produced in me a desire to grab time by the hands and stop it, a temptation to rest indefinitely on the gentle grass. Pure air. The same air that wet the cheeks of the people of the mountain, now those women far away transporting their buckets on their heads, at other times those children running around… Meanwhile, the elders exercise their right to contemplate. Moussa gestured with his head and started to walk, as though his life depended on it. I resisted with my knees several times, bothered inside by the impossibility to stop, to move in circles, go back, you know, losing myself in my thoughts and the landscape, a photo. Instead, I had to follow the trail of olympic Moussa who had not slowed down his rhythm, the madness. I thought that sometimes a guide is like a taxi driver, quick, quick, another client, another client, money, money. Still. In spite of everything. It was impossible to deny Mother Nature’s caresses, full of silence and anaesthesia, hanging out carpets of tranquillity and solace. There was nothing to be done against. Her. We continued climbing. Almost everything was green and a little yellow, yet on arriving at a type of landing, we ran into a waterfall from whose crest children were diving, sliding, naked, falling into a small lake. They were having a ball and when I took out my camera, they all jumped in front of me to ensure that they’d appear in the photos. Some children called me “fote” (or something like that), while laughing, a word that I often heard in the days that followed. “Fote”, Moussa explained, meant ‘white man’ and what had become a typical expression for the ‘classic ‘white man’ that you so often hear in English speaking Africa. Moussa, amused, told me to answer the children by saying “foriat” (or something like that) which means ‘black man’. Fote! Foriat! Fote! Foriat! More laughter. We kept climbing and Moussa began to slow down his rhythm, to take a breath. In an effort to hold the moment once again, I tried to look behind me at the slightest chance, taking in the wide, spectacular landscape that opened up before me, taming the suffocating heat and the thirst, calmed also by our bottles of water. You could dehydrate in the Gangan’, Samory had warned me. During the ascent, we spoke to a group of women with their buckets on their heads who climbed the Gangan to arrive at the village of Kiria where I had to fulfil my mission. The girls climbed calmly and steadily, it seemed as though neither they nor us wanted to be rid of the mutual company. The one who was in front smiled and told me that they took this route every day. “From early in the morning we come down the mountain with our buckets filled with food to sell in Kindia. In the afternoon, we climb back up. From Monday to Sunday”. 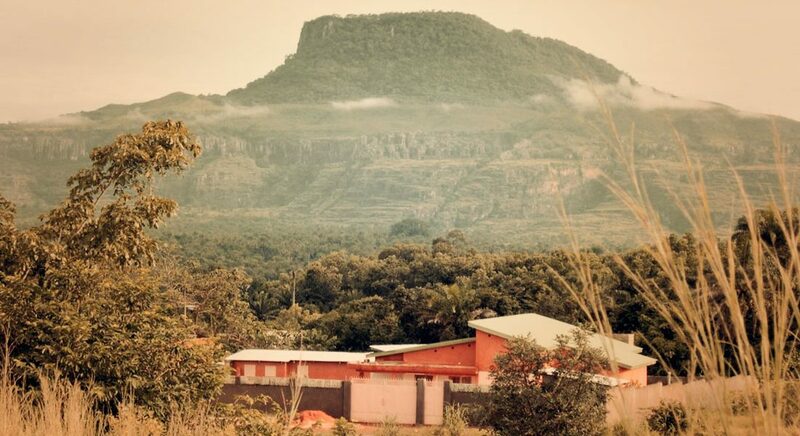 Moussa sat on a rock, completely dripping in sweat, his mouth open, noting how the women from the market outpaced us. “I’m really tired”, the Guinean told me, with his tongue hanging out. I pursed my lips a little and asked how much longer was left. The Guinean told me ten minutes and so the decision was clear: we had to make the final stretch. Moussa drank more water and soon after we set off again, and almost without realising it, we arrived at the summit of the mountain, where there was a hamlet with its adobe houses and thatched roofs. It was Kiria. A man sitting on a wooden bench looked at us a little discontented, as though we had interrupted his peace. I sat by his side and little by little our energies harmonised, up the point that he offered me a guava. I asked the man about Monique’s family and he gestured towards a house at the back and I stood up. I walked alongside Moussa and on arriving at the house, several women and a few kids and babies gave me a look somewhere between caution and fear. They were wearing torn rags, standing in front of some dirty cauldrons that were heating corn on the cob. Then the children in the family went inside the shacks and came out with some photos where I could appraise the white Monique surrounded by her “family”, at the beach, collecting coconuts or simply running in the middle of the forest. “Monique appeared one day in Kiria and since then she took us under her wing”, said one of the kids. I smiled and after biting into a banana, I didn’t know what else to say and I smiled at them again. We exchanged a few more smiles, without the need to talk, then I gave them some money with great pleasure, money that they received naturally, with dignity, without fuss, without revelry. In the same way that I have seen in other poor people when they receive money from the rich. Moussa also gave something to the family and received grapefruit and bananas in return. When the sun threatened to set we decided to leave Kiria. Moussa waved his hand and told me to follow him, that he knew the way well. A young mother and two kids accompanied us, Monique’s “family”. We went through several green pathways, surrounded by small, natural gardens, moving into a green miracle. In the middle of a path, I asked the young mother if she could take my photo, and she did so smiling with a purity and kindness that was so far removed from envy, jealousy, rage. All of that. A rebirth. Like crystal water. Once we had left the green orchard behind us, the girl and the kids bid us farewell with more tender smiles and returned to Kiria. Moussa and I continued descending steep slopes, with greenish ledges scattered here and there. Within minutes, the Guinean did a half turn, entered a dubious footpath, retreated, brought one finger from his right hand and another from his left to his temples and failed to recognise that he was lost. After several more footpaths, we were finally able to find a trail that led us back to Kindia amidst yellow and green. Now back in Kindia, Moussa suggested visiting the waterfalls La Voile de la Mariée, “there is still time”, he said, looking at his watch, and so we approached the waterfalls by means of a bumpy dirt track. On this lethargic Sunday, one could just about hear the breathing of a guard and a quiet artist, who showed me his collection of masks. I nodded and walked around the volcanic sand and I stood erect next to a huge waterfall which soaked me in serenity and offered me a new world made up of the droplets that departed from the torrent on contact with the tranquil lake. Still elevated, on a scrap of sand, a tiny beach shrouded in bamboo trees which tangled you up in peace and silence. Later, I opened my eyes and decided to buy a mask. The mask, which according to Africans, serves as an agent between the invisible unknown world, and reality. Ah, reality.